Egypt Polarized as 200,000 Tahrir demonstrators and Crowds in other Cities protest Morsi's "Temporary Dictatorship"
On Wednesday morning, in the wake of a huge demonstration downtown Cairo, the crowds assembled in Tahrir Square faced tear gas barrages whenever they moved out of the center of the square. Some 36 persons were wounded in Port Said in clashes Wednesday between anti-government forces and the Muslim Brotherhood. The fight began when three Ultras (soccer fanatics) of the Green Eagle soccer club in the city were attacked when they passed near the Muslim Brotherhood HQ. Liberals, leftists, nationalists, Muslims, Christians, trade unions, professionals, movie stars, lawyers and judges united on Tuesday throughout Egypt to deploy a whole range of protest techniques against last Thursday’s Executive Order of President Muhammad Morsi of the Muslim Brotherhood, which put him above all judicial authority. Some clashes broke out with Morsi followers, and some 76 were injured. 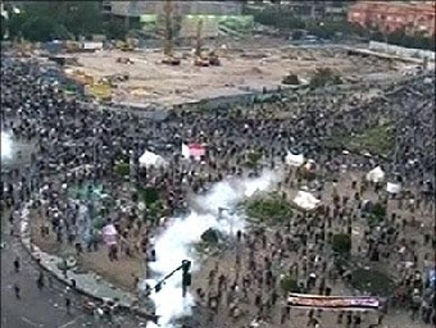 The crowd at the downtown Tahrir Square was estimated by some newspapers at 200,000, among the largest demonstrations held since the fall of Hosni Mubarak in February, 2011. It is worrisome that many in the crowd have started to demand ‘the fall of the regime’ and the ‘departure of Morsi.’ Since he is an elected leader, it would be undemocratic for him to be unseated by crowd action, and the danger that the Muslim Brotherhood might be radicalized by losing the fruits of both of its electoral victories is great. The spokesman for the Egyptian military Pointedly underlined that the army is there to defend the interests of the nation and that its sole loyalty is to the people. He did not say anything about protecting the government, raising the question of where the army’s loyalty might lie if the political polarization worsens. Performing artists had their own column in the march in Cairo. Journalists and attorneys were organized by their guilds to participate. Even a group of judges marched, single file, into Tahrir Square. Cairo’s courts were closed and on strike for the third day running in protest against the insult of the president’s decree. A huge procession walked from the slum of Shubra to Tahrir Square Tuesday, joined by Muhammad Elbaradei (former head of the IAEA). About half of the densely packed population of Shubra is Christian, and as a working class district its parties include the Free Egyptians, the Social Democratic Egyptian Party, the Popular Coalition, and the Revolutionary Socialist Movement. Unfortunately, they are good at mobilizing for marches and rallies, but not good at winning elections. They insisted on the abrogation of Morsi’s Executive Order. Among the demands of the protesters was that the Constituent Assembly writing the constitution be reconstituted. I had begun with 100 members, but 22 have withdrawn, along with 7 reserve members, and the remaining 78 are disproportionately loyal to the Muslim Brotherhood, raising fears that the constitution will be overly religious in character. Morsi’s claim of extra-judicial power struck many Egyptians as a creeping dictatorship, and there are fears that the Brotherhood was plotting to bring back the dissolved parliament of fall, 2011, which was dominated by members of the Brotherhood party, Freedom and Justice, and by hard line Salafi fundamentalists. With the presidency and parliament and an established principle that both were beyond the authority of the judiciary, the Brotherhood could hope to rule Egypt as a virtual one-party state, succeeding the one-party dominance of Hosni Mubarak’s National Democratic party.